Have you ever known a person who becomes a "connoisseur" of wine? Often that person seems unhappy with most of the wine he or she drinks. The connoisseur has too often learned to be mostly unhappy. Isn't that ironic? It's the fluid you and your friends' hearts pump. The path to becoming "one who knows" (from Old French: connoisseur) starts with drinking just any ol' wine. Then slowly taste discrimination comes along. Later, the risk grows that fewer and fewer wines will be as satisfying as they once were. "The one who knows" perhaps may not know the most important thing about wine: It isn't the red stuff in the glass; it's the quality of people with whom you share wine that is important. It's their lives, their flesh and blood in your life that matters most. Along the way, wine, or tango, or music sometimes no longer satisfies the "one who knows" who has become impersonal in their "knowing." Unfortunately this pseudo-connoisseur has learned so much it has them standing alone with the thing they know. Perhaps the Spanish version of the Old French word, connoisseur, conocer, can give us some insight about the difference between the pseudo-connoisseur and the true connoisseur: Conocer is personal knowing. Saber is impersonal knowing. So the question, "Do you know [sabe] who that person is?" is answered with saber if you know who the person is. However if you know her personally, you use conocer: "Sí, la conozco." [Yes, I know her personally.] If someone asks you, ¿Conoces Buenos Aires? The answer is "no" if you have never walked her streets or met her people. Knowing personally is the antidote against poisoning your wine, your tango or your music appreciation. I try to focus on the larger picture. A true connoisseur knows the larger meaning of sharing wine. It may be a profoundly religious moment. It may be a celebration of a new love or very old friendship. Isn't it the same way with tango and other beautiful things in life? A step in the right direction is to be a true connoisseur of taste in three things around the thing you love: People, presentation and sustainability. In wine, it would be a good-tasting wine, shared with quality people, and the excellent presentation of the wine at your gathering. Finally, can this be sustained? Can you afford to do this again? In tango, it is tango-talent (as the thing "to know"), plus people with culture and depth whom you know. A milonga with great music, lighting and a decent floor is the presentation. Finally, can this be sustained? Did you ruin your feet or your pocketbook? If you are out dancing just to be a walking encyclopedia of steps and to dance with only the best, you are probably on the the path to be unhappy with nearly every partner at a milonga. It is all too impersonal. I am not suggesting, ladies, that you drink cheap wine! I understand that you have the right to be picky. Save your feet. Avoid the guy who doesn't bathe. Turn away your gaze from the tango tomcat. I understand why this must be done: Dancing with men who jerk you around, step on your feet, and make you and your clothes reek is not sustainable! If I hold a beginner or any person with reverence and I am open to being present, I "hear" the story of a human being in front of me and that somehow harmonizes with the music in a very special way. I believe that is what truly brings you back to tango over and over. Keep doing this. You will be blessed with many great tandas. I have learned this wisdom from tango more than anything else in my life. I want to be a true connoisseur. I want to be present with the person with whom I can share my wine, my tango, my music, my time. I truly want to be the "one who knows." Embracing the moment is tango. It's life. 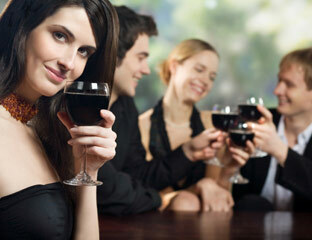 Photo credit is on this blog page about the growing market of women wine connoisseurs. Why do we stop dancing? Our human minds were wired to dance and sing. That is what makes us human. (a) Round up some children. In 10 minutes, notice the little homo sapiens go wild. If adults are around -- or older children -- we laugh. Later, the same little homo sapiens grow up and say, "I have two left feet." They have forgotten who they were. They have forgotten what it is like to be essentially human -- the only baby animals who naturally dance without being taught or coaxed. I wrote a draft post about growing up and forgetting. But felt I should write about the same concept in poetry instead. The first poem was "When we were both three" -- a poem about a rare moment when my thirteen-year-old son danced. This is the kid that loved to dance as a small child. What happens to our dancing self? Laughter made our little-kid self go and hide, I'm afraid. The feeling that children get is that the people laughing are laughing in a way to hurt or to say that our dancing is a big joke. It is mostly not intended to hurt, but my guess is being laughed at is the epicenter of why people stop dancing. Today I present the second poem (below), which is actually lyrics to a song about my being a kid and having a plastic guitar. My family said I called this plastic instrument my "Hound Dog." The guitar was named after the one song I loved to sing from Elvis Presley: "You Ain't Nothing but a Hound Dog." Writing the first poem about my youngest son being three brought up this forgotten event in my own life. Some of my first dancing (like Elvis) was with my plastic guitar as a prop. I sang the lyrics of my new song ("Ain't Nothing like my Hound Dog") to my old 19-year-old son. I felt good that he liked it. "Yeah, I wrote it during a very boring meeting at work," I told him. I again felt very happy when he followed up with sending me a YouTube video that he felt went along with the theme of enjoying dance but being laughed at. Before my presentation of my song "Ain't Nothing like my Hound Dog," let's first watch the video my son sent me: The child is talented young dancer. Pay attention to the laughter in the background. When will this budding dancer realize that people should enjoy and not laugh? I am sure that no harm is meant. People laugh. And maybe it will never be interpreted as being wrong. The chances are high, however, that he eventually have someone say something mean or hurtful, no matter how good he is at song or dance as he grows up. Many of us who dance tango had to rediscover the dancer in us! Where was it hiding? My song below is dedicated to Gail Schumacher, the neighbor who smashed my plastic guitar. Yes, I did hit her over the head with the remaining bits of guitar. Yes, she did cry. Sorry Gail, but luckily when you went to tell on me, my mother had witnessed your violent reaction to my song and dance. Gail, I'm back dancing. It it took a while, but I am back. Hound Dog’s strings I strum all day. Hound Dog’s the only song I play. Hound Dog’s the howling of my lips. Sing’n all the passion I can. Dancing all the passion I can. She says she’s tired of sing’n and hips. Three-year old rage: Hound Dog’s on her head. Hound Dog’s last song’s a hit! -- on her head! Sing, dance like no one’s around. Love your dancing and sing’n sound. 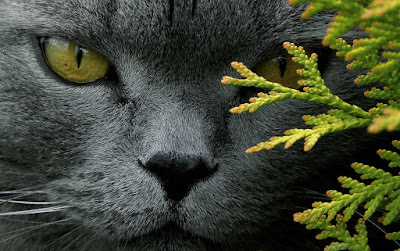 Others may listen and stop you by hurt. Give them your veggies, eat the dessert! 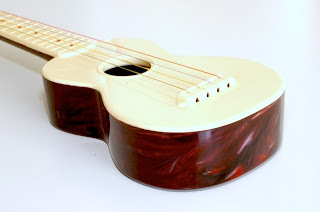 Photo Credit of plastic guitar. Tango Jockeys put the dancer, not themselves, in the limelight. Over the years, I have learned what makes a disc jockey good from many examples of ruined milongas. Mostly DJs who ruin a milonga are not evil, they just are inexperienced and do not know the depth of the task they have taken on. The worst DJ possible is one that wants to reinvent the milonga in their own image and likeness, throwing out tradition, form and predictability. Originally, I wanted to help DJ's, but I think this is the role of an entire community to support the DJ's. We can all be advocates of having the best music to dance to. The entire community needs to be educated and advocate for the best dance music at their own milongas without being too passive nor aggressive. I have helped some DJs that were open to help. One woman was an outsider in the city. I took her aside, and told her about tandas and cortinas. I wanted her to be successful because she was trying her best, and she just did not know. She took my advice. Others in town had never taken the time to tell her, and just did not come to her milongas after one try. The TJ's responsibility to buy or influence organizers to have high quality equipment. Resources for buying quality music. How a TJ deals with listeners' wildly different views of volume. How a TJ deals with tempi during a milonga. A video documentary by musicians/recording engineers condensed recordings (MP3's). 1 = Describes the “still learning” inexperienced DJ (bless their hearts). 5= Describes an experienced TJ very well. Features a single orchestra in most tandas. Tandas with longer tunes are still limited to 12-15 minutes. Plays tango hits, but also knows many lesser-known, high-fidelity, danceable tangos. Plays milonga tandas that have a warm up phase (slower). Late-night milonga tandas are also slower. Plays non-danceable cortinas that clear the floor. Plays cortinas long enough to clear the floor. If there's a nuevo tanda, it does not replace the milonga tanda. The rest of the evening is: T-T-V-T-T-M = about 1 hr. Is attentive to changes in volume between recordings, and changes in room noise. Never blasts or plays too quietly. Understands how to equalize the sound system to the room or has equipment that does this (this can be an add-on to permanent equipment). Knows how to adjust a microphone so it never squeals (not rocket science). Insists on speaker placement that is not harmful to hearing on one side of the room (placed below or above two meters) if possible. Projects or displays the composer/orchestra/name of song/name of vocalist. Announces the last tanda before the penultimate tanda and plays the Cumparcita so that couples who came together can dance the last dance. If the DJ is also a passionate dancer, he/she has remote equipment. Listens to the organizer, who knows the expectations of those at the milonga. The crowd expects mostly Época de Oro tandas? Is a DJ, avoids being a hobby "musicologist" playing all the music we have never heard but should. Provides short silence pauses between songs. Regarding owning equipment: A TJ does not necessarily have to own their own equipment and move it around to each milonga. 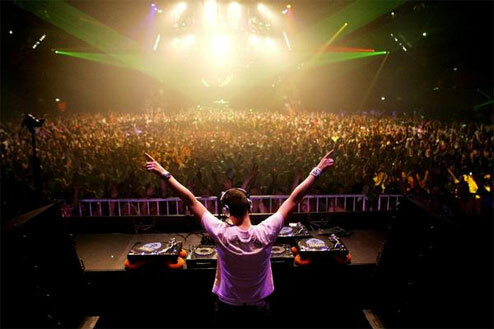 Ultimately it is up to the DJ's influence organizers on equipment that allows them to serve the dancers better. If I am a pianist playing at a piano bar on an out of tune upright piano, maybe I need to have a talk with the owner/organizer and suggest getting an 88-key Steinway or a 97-key Bösendorfer. A "DJ" with keeps coming back to the same milonga with poor equipment; a "TJ" refuses to come back to a place which makes him/her create a disservice to the dancers. Ditto for musicians that rely on a place that provides a piano. Musicians and DJ's have the same problem with dancers who widely disagree if the volume correct: Andy's tips: "Loudness is a very difficult topic. If I get complains, it is about loudness, but in all directions; one guy complains it is not loud enough and 10 seconds later, before changing anything, another one complains it is too loud. My solution is to have a good loudness compensation in the software to keep all songs equally loud and the other one to keep the overall level at 85-88 dB (A). For this you need a measuring device, or a calibrated app. In a recent paper several apps were tested and the result is that you can forget them all, except one for iphones. The sensitivity of the public is also very different. Argentines and Italians want it extremely loud, Germans a little bit less loud. It depends also on the quality of the recordings. Almost all are mastered in such way that the range 1 - 6 KHz is pushed up. It is the range where the voice clarity is (2,5 to 3 KHz) and the overtones of the bando (3-8 KHz) but also where the distortions become very annoying. When you hear it at home you think this is a good recording, because it is brighter. But if such a record is played too loud and you are unfortunately near or below the speaker, the violins go straight through your brain. The solution is a band compressor and limiter. But this is a very dangerous tool if don't know what you do. Since most DJs have problems with a simple equalizer, it is better if they don't use such thing." "There is another issue: changing speed within a tanda. Many of the available tanda sets (especially those from well known Argentinian DJs) don't change speed (measured in Steps per minute or Spm for me) at all. Or they go, say 60/62/64/60 Spm, thus, ending with the same sped they started. Many even get slower. Do so, if you want to finish the usual weekly milonga earlier. If you want it lively, get people excited, speed them up. Not every tanda, of course, but the idea is, don't make people sleepy. Be aware of the speed of what you play, measure it. Simply count! I never encountered a software that does this in acceptable quality, so I had/have to do it manually. Who said DJing is just going ahead and play? There is work to be done before you really start. Some forget this. To make a long story short: Know your music!" Appendix Five for curious DJ's: Learn from musician's frustrations with compressed sound (MP3's). * For Europeans only: “Jockey” is not a gender-specific term. Europeans like to say “Disc Jane,” for women. The term “disc jockey” started in the US. The term “jockey” is not gender specific in English. There are no Disc Jacks, therefore there are no Disc Janes. "Yo no sé que me han hecho tus ojos" by Alberto Moran, rather than Miguel Calo's version. Thank you for playing another version, but I prefer hearing a great band rather an honorable mention version or even worse a garage band play the same song. Photo Credit: I cannot find the source of the "great" DJ photo. If you know, please inform me. Print-out DJ Self-Assessment matrices from above, are at this link. Or for the version in the MS Word format: Go to this link. I will be updating this from time to time. You can edit for yourself and your community norms. For now, I suggest just giving this page link to DJ's if they need or really want help. Note: This information is for the good of milongas worldwide. Of course permission is granted for copying. Tango: Man Talk / Woman Listen?